The characters in the latest Disney film frequently attack each other, sometimes eat each other, and spend the whole time running around naked. 89 min. Disneynature. Directors: Keith Scholey, Alastair Fothergill. Cast: Samuel L. Jackson. Parents be warned: the characters in the latest Disney film frequently attack each other, sometimes eat each other, and spend the whole time running around naked. 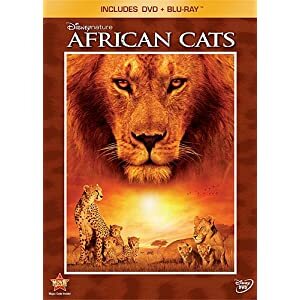 Before you ring up the MPAA, I suppose you should also know that the stars of the G-rated African Cats are animals. Still, you almost wouldn’t know it from the script of this Disneynature documentary, which hard-sells the anthropomorphic qualities of its stars: lions and cheetahs, with a supporting cast that includes buffalo, crocodiles, elephants, giraffes, hippos, hyenas, jackals, ostriches, rhino, Thompson’s gazelles, warthogs, and zebras. “Buffalo,” narrator Samuel L. Jackson informs us, “are grumpy,” and “There’s nothing better for a lion than close companionship.” Well, that and a good, rare wildebeest carcass. Those lions: they’re just like us. Anyway, African Cats unfolds on the Masai Mara National Reserve in Kenya, where the filmmakers seemingly trailed a pride of lions and a coalition of cheetahs. Beyond identifying the Reserve and providing comically dubious “where are they now?” end titles for the characters, directors Alastair Fothergill and Keith Scholey do not contextualize the footage, who named the animals, or other matter-of-fact details. They focus instead on constructing a story for maximum “oohs” and “awws”—understandable given the clear attempt to reach a family audience. Even with the extra help the “true life adventure” gets in the story department (including from The Lion King producer Don Hahn, here an executive producer and narration editor), the wee ones at a recent screening were chatty and restless, signaling that African Cats will play best to middle schoolers and precocious elementary students. The narration mentions predatory practice, and death when it comes, but the visuals are not graphic (we see the cats make tackles, but never tear into flesh). African Cats may not be as egregious as March of the Penguins in viewing and articulating animal nature through a human filter, but gradually the approach wears, as Jackson describes how the “determined” or “terrified” creatures “comfort,” “appreciate,” “can’t wait to show off” or show “desperate hope,” “confidence” or “extraordinary courage” as the cubs navigate their “huge adventure” on the way to becoming “young adults.” By the end, you’d be forgiven for worrying less about the heroes surviving in the wild and more about how these cats will fare in a dog-eat-dog job market. 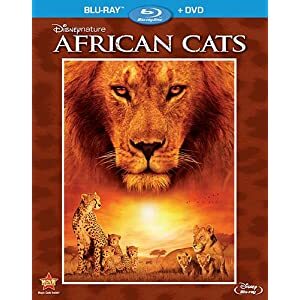 Disney continues its commitment to Blu-ray by releasing African Cats in two editions: Blu-ray + DVD combo pack and DVD + Blu-ray combo pack. Well-timed to capitalize on the second-wind Lion King craze, the Blu-ray features a spectacular HD transfer. The image is to drool for, excelling in all categories, but particularly in razor-sharpness, texture and color (the only proviso—due entirely to the source footage—is a bit of breakup in low-light night footage). Sound also impresses, with a warm DTS-HD Master Audio 5.1 surround mix that ably serves the Sam Jackson narration, sprightly score, and savannah sound effects. Bonus features, all presented in HD, include PIP Filmmaker Annotations (HD) that comprise video commentary, behind-the-scenes footage, filmmaker/crew interviews, and information from conservationists; the brief, self-explanatory promos "Disney & Nature" and "Save the Savanna"; and a "Music Video" of the song "The World I Knew," performed by Jordin Sparks. The included DVD repeats the two promos. All site content © 2000-2019 Peter Canavese. Page generated at 04/18/2019 05:39:50AM.